On 17 October 2002, ESA's INTEGRAL spacecraft was launched from the Baikonur cosmodrome in Kazakhstan, on a mission to observe the ever-changing, powerful, and violent cosmos. 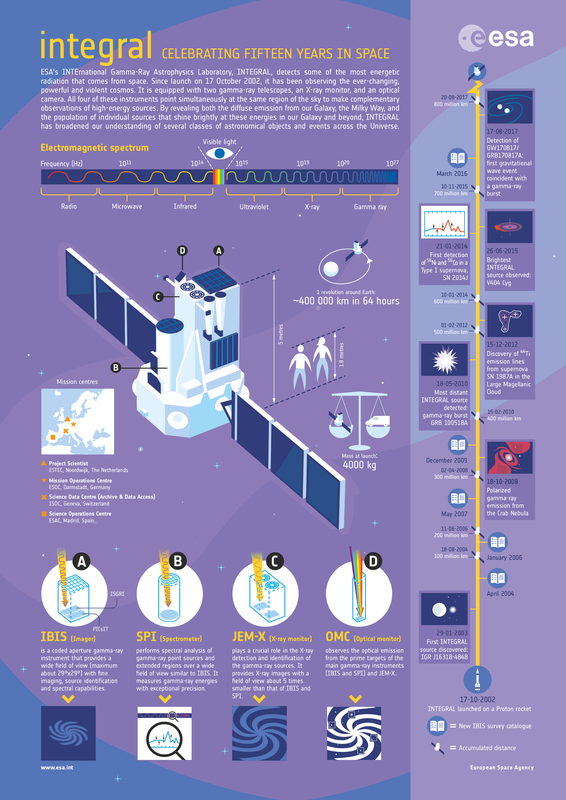 As the first space observatory to simultaneously observe objects in gamma rays, X-rays, and visible light, INTEGRAL has achieved a number of notable science results during the past 15 years. A recent highlight is the detection of gamma-rays associated, for the first time, with gravitational waves, which had been detected seconds earlier by the Laser Interferometer Gravitational-wave Observatory (LIGO) experiment. This historic discovery confirmed that such short gamma-ray bursts are caused by the merger of two neutron stars. Other memorable findings include the detection of V404 Cyg – a monster black hole that became active after 26 years of slumber; catching a ‘dead’ star exploding as a supernova; and discovering polarised emission from a supernova remnant, the Crab Nebula, which provided insight into the acceleration processes in cosmic sources. In addition, INTEGRAL has revealed the diffuse emission from our Galaxy, the Milky Way, as well as monitoring the population of individual sources that shine brightly in gamma rays in our Galaxy and beyond. Along the way, the INTEGRAL team have provided regular updates to the IBIS catalogue – an all-sky catalogue of soft gamma-ray celestial sources. During the 15 years of operations the spacecraft has travelled almost 800 million km along an elliptical orbit that has varied over time. In 2015, a series of manoeuvres were carried out to ensure that the satellite's eventual entry into the atmosphere, in 2029, will meet the Agency's guidelines for minimising space debris. Download a printable version (pdf format) of this infographic here.